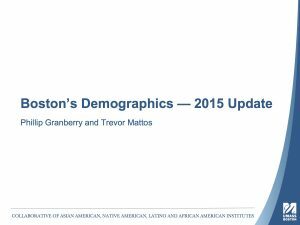 The following presentation was introduced at the conference by Gastón Institute’s senior researcher Phillip Granberry and Cedric Woods, director of the Institute for New England Native American Studies. The document was prepared with the collaboration of Gastón Institute’s graduate research assistant Trevor Mattos. UMass Boston’s CANALA Institutes invite you to a day-long conference of leaders and advocates from Greater Boston’s diverse communities of color. We will explore ways for communities and organizations to enhance their individual and collective capacities through collaboration. How and in what areas can collaboration across racial and ethnic lines address more effectively persistent problems of inequality and neglect? How can we strategize and organize to realize a vision where resources, opportunities, and power are shared more equitably? 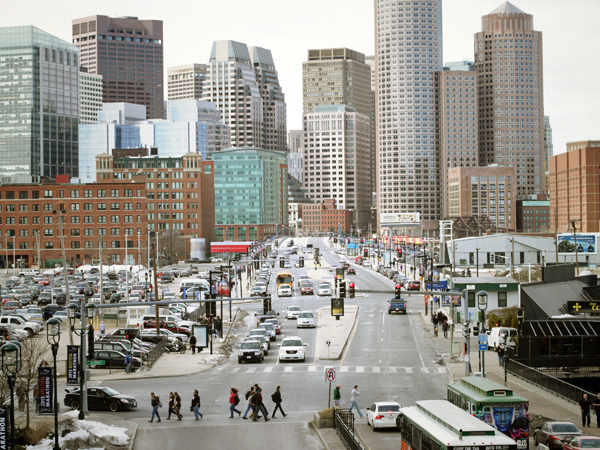 There will be panels, breakout sessions, networking, and chances to reflect on current data about Boston’s evolving sociodemographic landscape and on plans to move forward. James Jennings (Tufts University), Juan Leyton (Dudley Street Neighborhood Initiative), Lydia Lowe (Chinese Progressive Association) and Raquel Halsey (North American Indian Center of Boston). Initiative funded by the UMass Boston Office of the Vice Provost for Research and Strategic Initiatives, and sponsored by Eastern Bank. UMass Boston is one of only two universities in the country with free-standing research institutes dedicated to four major communities of color in the U.S: African American, Asian American, Latino and Native American. As the umbrella for the four institutes, CANALA provides in-depth research, community engagement, education and thought leadership aimed at: advancing opportunity and equity for diverse racial and ethnic communities in greater Boston and throughout Massachusetts; fostering communication, cooperation and collective action across racial and ethnic boundaries for Boston’s majority-minority population; and helping to shape and support the public’s social, economic and cultural understanding of evolving racial and ethnic diversities in Boston, Massachusetts, New England and beyond. 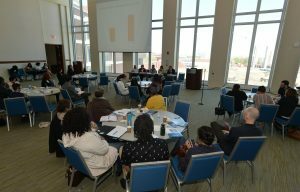 Each individual institute brings experience and expertise addressing a wide variety of issues of concern to the communities it serves; each has built important relationships with community partners throughout the Boston area and statewide while working to promote equity and opportunity for students of color on the UMass Boston campus. Since CANALA’s beginnings in 2015, the urgency of our mission has increased. In today’s volatile political climate, CANALA hopes to be a catalyst for new levels of dialog and alliance-building, amplifying the voice and influence of those who have been historically marginalized in order to build a more inclusive, just and equitable Boston that sets a positive standard for the nation. The Institute for Asian American Studies (IAAS) utilizes resources and expertise from the university and the community to conduct research on Asian Americans; to strengthen and further Asian American involvement in political, economic, social, and cultural life; and to improve opportunities and campus life for Asian American faculty, staff, and students and for those interested in Asian Americans. Current projects include a detailed portrait of the Vietnamese community in Fields Corner, and capacity-building for the APIs ICAN! Network to improve access to services for limited English speaking Asian Americans. IAAS is leading a two-year, multi-university NIH-funded study using computer technology to build the health literacy of residents of Boston’s Chinatown regarding highway pollution, partnering with the Boston Chinatown Neighborhood Center. Additional partners in the Asian American community include the Asian American Resource Workshop, Viet Aid and the Chinese Progressive Association. The Institute for New England Native American Studies (INENAS) works to develop collaborative relationships, projects, and programs between Native American tribes and organizations of the New England region and all of the UMass campuses. INENAS is currently the academic partner for a federal grant from the Department of Justice’s Office of Violence Against Women to the North American Indian Center of Boston, has worked with the Bureau of Substance Abuse Services to develop culturally competent approaches to alcohol and drug use among Native American teens, and recently completed a Massachusetts Foundation for the Humanities-funded project bringing together Native communities from throughout the state to examine issues of current and historical concern from a human rights perspective. INENAS partners with a wide variety of tribes and organizations, including North American Indian Center of Boston, the Mashpee Wampanoag and Nipmuc tribes, Native American Lifelines, Native American Awareness and the Massachusetts Commission on Indian Affairs. The Mauricio Gastón Institute for Latino Community Development and Public Policy works to inform policymakers about issues vital to the Massachusetts’ growing Latino population, and to promote equity, opportunity and civic engagement in Latino communities. The Gastón has been engaged in a five-year NIH-funded community-based participatory research project addressing communication about sexual health between Puerto Rican mothers and children, and recently completed an initiative funded by the Office of Minority Health to enroll uninsured Latinos in health insurance through the Affordable Care Act. The Gastón Institute’s research on English Language Learners in the Boston Public Schools was instrumental in improving policies and practices toward Boston’s ELL students. The Gastón Institute reaches out to the Latino community through biannual regional gatherings and recently sponsored a statewide conference on ELLs and charter schools. The Gastón’s greater Boston community partners include Hyde Square Task Force, Alianza Hispana, East Boston Ecumenical Community Council, and Greater Boston Latino Network among others. The William Monroe Trotter Institute for the Study of Black History and Culture addresses the needs and concerns of African heritage communities in Boston and Massachusetts through research, technical assistance, and public service. The Trotter recently received grants from the Boston Foundation and Hyams Foundation for its Rising Tide project, an intergenerational leadership development initiative bringing together Boston youth and young adults with veteran social justice activists. A recent Big Read grant from the National Endowment for the Arts supported a community-wide exploration of African diaspora immigration. The Trotter’s most recent report, “Blacks in Massachusetts: Comparative Demographic, Social and Economic Experiences with Whites, Latinos and Asians”, brings together scholars from a range of disciplines for a comprehensive look at the status of Black lives in the state. The Trotter has worked with a variety of community partners throughout Boston area, including Union of Minority Neighborhoods, the Boston Public Library, Dudley Street Neighborhood Initiative, Franklin Park Coalition, Fairmount Indigo Network, Skylab, and the BARE (Boston Alliance for Racial Equity) Initiative.